Pedestrian accidents, which involve motor vehicles hitting people crossing or on the side of roadways, are among the most devastating types of motor vehicle accidents that can occur. What may be as tragic as the outcomes of these accidents is the knowledge that, in many cases, they could have been prevented if motorist had been more careful and less negligent when driving. These facts about pedestrian accidents highlight some important info about the victims, causes and options for justice after these accidents occur. In this article we’ll discuss some important facts about pedestrian accidents, their victims and compensation in these cases. If you have questions about your rights in these cases or need more advice pertaining to your case, the Boulder car and pedestrian accident attorneys at Cederberg Law welcome you to attend a free, no obligations initial consult. 1. 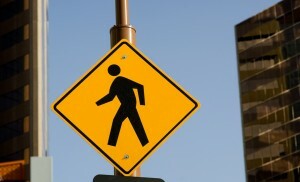 Pedestrian accidents have been increasing in recent years. Although the overall number of traffic accidents between vehicles has been decreasing over the past few years, unfortunately, the number of pedestrian accidents seems to be on the rise. In fact, the National Highway Traffic Safety Administration (NHTSA) reports that, over the previous three or so years, the number of pedestrian accidents that have occurred on U.S. roadways has increased by about 4 percent. Every 8 or so minutes, someone in the U.S. is hurt in a pedestrian accident. Every 2 or so hours, someone in the U.S. is killed in a pedestrian accident. Pedestrians are about 1.5 times more likely than the occupants of passenger vehicles to sustain fatal injuries every time they embark on a trip. The NHTSA also reports that pedestrian accidents are most likely to occur in cities (i.e., urban areas) at nighttime and at locations other than intersections (i.e., in areas that lack signals to facilitate the flow of traffic/the movement of pedestrians). 2. Drivers only need to be traveling at about 10 mph to cause serious injuries in pedestrian accidents. Did you know that vehicles only have to be traveling at about 10mph to cause irreversible injuries in pedestrian accidents? Here are some more facts about these accidents. The complete lack of protection from the impact, which ultimately means that pedestrians’ bodies end up absorbing the force from the impact (instead of the frame of a vehicle taking the brunt of an impact when collisions occur). While pedestrian accidents that involve vehicles going about 10 mph can result in irreversible, debilitating injuries (like, for example, brain and spinal cord injuries), fatal pedestrian accidents can occur when vehicles are going as slow as 30 mph (or less, depending on the size and weight of the vehicle). 3. Young children and the elderly are most often the victims of pedestrian accidents. Approximately 11 percent of all of the people killed in pedestrian accidents are children who are 14 years old and younger. About 20 percent of the children involved in fatal pedestrian accidents were between the ages of 5 and 9 years old. People who were 65 years old and older were involved in about 11 percent of all pedestrian accidents resulting in injuries and in nearly 20 percent of all fatal pedestrian accidents. 4. Fatal pedestrian accidents are often caused by drunk drivers. Fall asleep behind the wheel, be distracted while driving or engage in other reckless behaviors that can significantly impair their awareness of and reactions to the presence of pedestrians. 5. After pedestrian accidents, contact Cederberg Law for superior legal representation. By far, the most important fact for people to know is that the Boulder car and pedestrian accident attorneys at Cederberg Law will be here for them and ready to fight for their rights if or when they are injured in pedestrian accidents. By turning to us in the aftermath of these terrible incidents, you can trust that your rights will be protected, that you will have superior legal representation and that you will have the best chances of securing the full amount of compensation you deserve. If you or a loved one has been hit by a car or has been injured in any type of motor vehicle accident, contact the Boulder car and pedestrian accident lawyers at Cederberg Law. Call us at 303-499-0449, or email us using the contact form at the side of the screen. Since 2011, our esteemed legal professionals have been successful at securing results and compensation for people who have been seriously injured in car accidents and other types of traffic accidents. Having handled countless cases, our attorneys have a deep understanding of the law, as well as the legal experience you need, and we can fiercely defend your rights in any legal setting. At Cederberg Law, you will not be handed off to a paralegal or assistant. You will receive personal attention and professional service from an experienced lawyer who cares about you and who is dedicated to providing you with superior legal services at every stage of your case. In addition to offering free initial consults and contingency fee options, our lawyers make hospital visits to ensure that you have access to the legal support you need – whenever you need it.